Twitter, Facebook, LinkedIn, and more—how many social media profiles do you have? Regardless of the number of social media accounts you’re managing, it can be a full-time job to keep active and engaged. Of course, this takes work, but there are steps that can help you save valuable time. With that in mind, I’ve compiled the following tips for managing social media profiles, starting with an introduction to some social media management tools. There are many social media tools out there designed to help you manage your profiles, including Hootsuite and TweetDeck. One of my favorites, though, is Sprout Social. This platform allows you to connect all of your accounts (Twitter, Facebook, and LinkedIn) into a single-stream dashboard—with just one login! From the tool’s single Compose window, you can post messages on all of your social media pages at the same time—including links, images, and video—or schedule them for later. Tip: Depending on the post, you may want to customize your copy for each platform, as each channel has different character limits and not all followers have the same interests. Download our Social Media Planning Worksheet for Financial Advisors for tips on cultivating a vibrant online presence, managing social media profiles, and driving traffic to your website. Another useful time-saving option is to create a social media planning calendar. Organizing your content by platform allows you to plan posts in advance, so you don’t have to worry about coming up with content at the last minute. Here’s what works for me: Every Monday, I set aside time on my calendar to find content, write posts for each platform, and then schedule them in Sprout Social for the entire week. Tip: If you decide to use a social media management tool, be sure to log in daily, so that you can consistently engage with users and reply to comments in a timely manner. So, you’re probably pretty excited about the time you could save by planning ahead and scheduling your posts on all of your social channels—but, wait, there’s more! Sprout Social also allows you to monitor your feeds, engage with your audience, and track firm and brand keywords. Under Sprout Social’s Messages tab, for example, you can view all notifications, including replies, comments, and new follows for each platform, plus engage back with users instantly. As you’re well aware, interacting with current and prospective clients is crucial to building relationships, so managing all of these interactions in one place can help you stay on top of your alerts and keep you top of mind with your clients. Tip: Once you’ve followed up on a notification, mark it as complete. This will keep your dashboard organized—and help you avoid missing any new alerts. 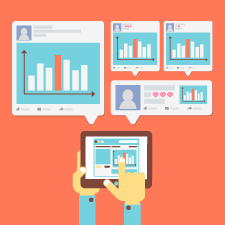 Each social media platform has its own analytics tool. Sprout Social provides analytics so you can easily track how people engage with your online presence. You can export reports for each platform detailing how many people you reached, audience engagement, and your most popular posts. Tip: By looking at which posts have been successful (or not), you can adjust your strategy to find content that appeals most to your audience. For example, you might try posting at different times or adding images. Even if you’re using a management tool, it can be daunting to manage all of your social media profiles, but it presents a good opportunity to delegate your work to a colleague or intern. Sprout Social allows you to add users to the management platform while working simultaneously with each other. You can divide the workload by adding tags to messages, assign specific tasks to individuals, and see who’s responded to a message in real-time. Tip: When multiple people are posting content, be sure to maintain a consistent voice that is representative of your brand. Don’t Set It and Forget It! Whether it’s Facebook, LinkedIn, or Twitter, you can’t just set it and forget it. If you are trying to make the most of your firm’s social media presence, you need to invest time finding the right content to stay engaged with clients and prospects. Using the tips discussed here, you’ll be able to spend less time managing your profiles and more time building better relationships. Have you had success using a social media management platform? Share your comments below! Editor's Note: This post was originally published in April 2013, but we've updated it to bring you more relevant and timely information.